In broad terms Conceptualism is the art of concepts or abstract ideas which take precedence over traditional aesthetic or material concerns. Conceptualism began in the first half of the twentieth century. It began not as an art movement but as a philosophy. It is a questioning philosophy: questioning the meaning of art itself. The work of Marcel Duchamp is fundamentally conceptualist. He argued that the idea of a work matters more than its physical representation. As an artistic movement Conceptualism took form in the 1960s. It was a reaction against the contemporary art of that decade. Conceptualism is also about liberation. Any medium can be used to portray the artistic idea. It could even be the absence of a medium. Conceptual art is a rebellion against commercial art. Why should a poor work by a great artist be valued more than an outstanding work by a lesser artist? Whilst some people find conceptual art refreshing and the only kind of art that is relevant to the contemporary world, many others consider it shocking, distasteful, lacking in real skill, ugly, and in fact not art at all. Conceptual art, it seems, is something that people either love or hate, either ‘get’ or do not ‘get’. 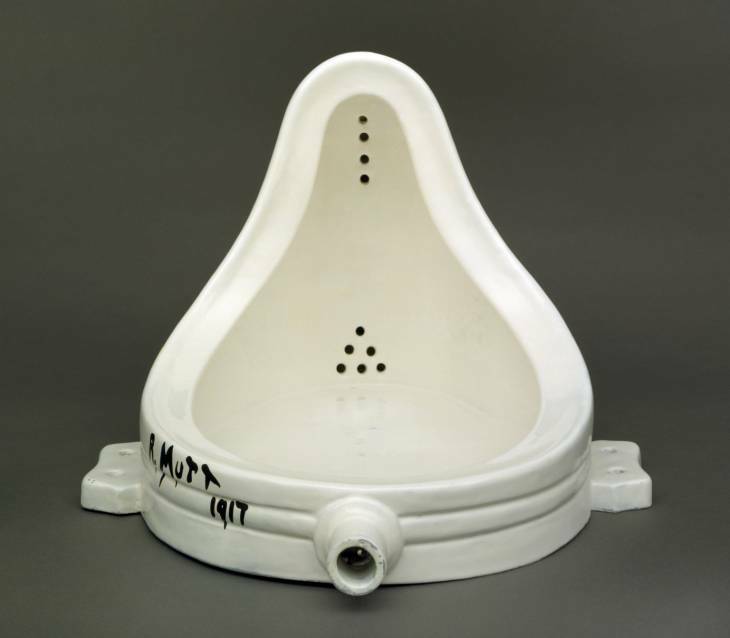 Marcel Duchamp – his Fountain of 1917 (mentioned in an earlier post) has been described as the birth of Conceptualism in art. 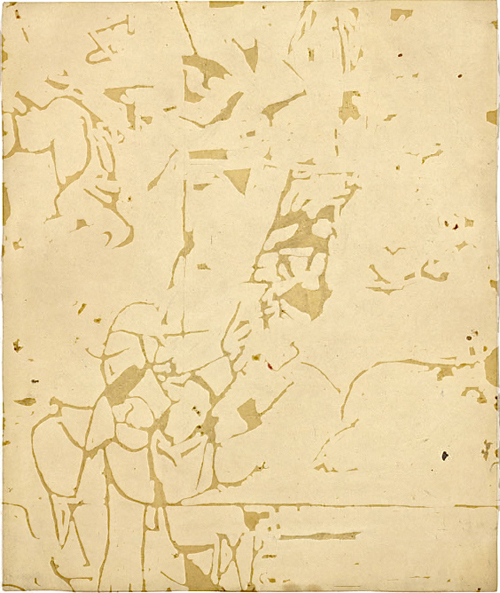 Robert Rauschenberg – in 1953 he exhibited a piece called Erased De Kooning Drawing, a drawing by Willem De Kooning which Rauschenberg erased. This questioned the fundamental nature of art, challenging the viewer to consider whether erasing another artist’s work could be a creative act, as well as whether the work was only ‘art’ because the famous Rauschenberg had done it. In 1961 he sent a telegram to the Galerie Iris Clert which said: ‘This is a portrait of Iris Clert if I say so.’ This was his contribution to a portrait exhibition. The erased drawing – is it art? 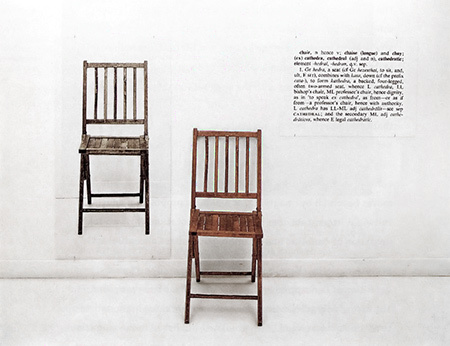 Joseph Kosuth – in 1965 he presented One and Three Chairs. The work consisted of a chair, its photo and a blow up of a definition of the word ‘chair’. Kosuth chose the definition from a dictionary. This is certainly ‘conceptual’. 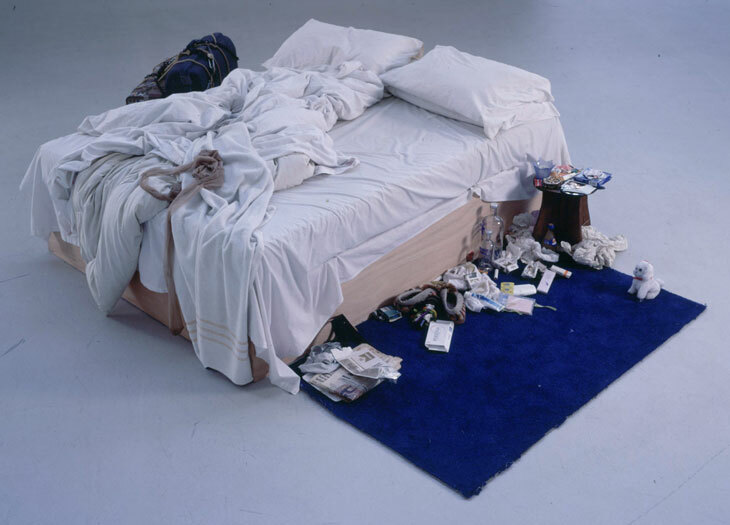 Tracey Emin – in 1999 she received a nomination for the Turner Prize. Part of her exhibit is My Bed, her dishevelled bed, surrounded by discarded objects such as condoms, blood-stained pants, bottles and her slippers. This is the ‘shocking’ side of Conceptualism. 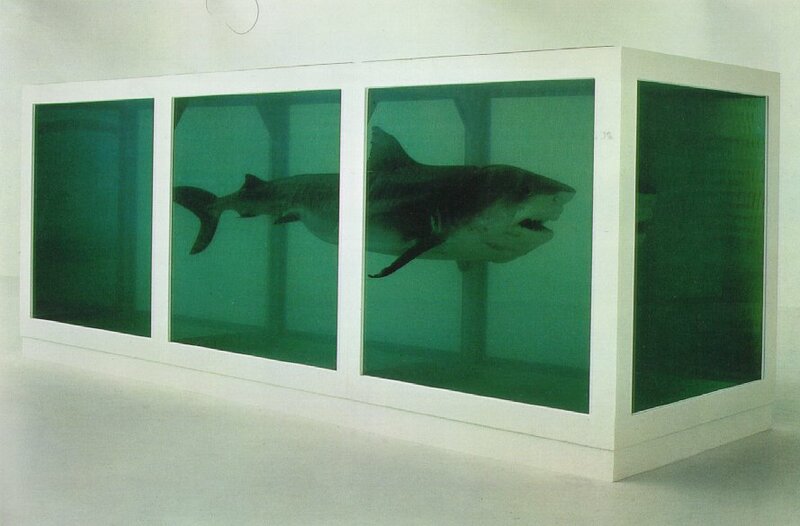 I think one of the most memorable key works of recent decades would be Damien Hirst’s 1991 The Physical Impossibility of Death in the Mind of Someone Living, a shark in formaldehyde in a vitrine. Of course there are many others I could have chosen. Conceptualism is alive and kicking. He bites – watch out! This entry was posted in Blog and tagged Conceptualism, Duchamp, Emin, Hirst, Isms, Kosuth, Rauschenberg. Bookmark the permalink.